ePublishing Knowledge BaseePublishing Knowledge BaseePublishing Knowledge Base Creating, Managing, and Selling Products How do I access store orders? If you have e-commerce on your website, you will want to track your orders. This article will show you how to access orders placed on your website. 1. 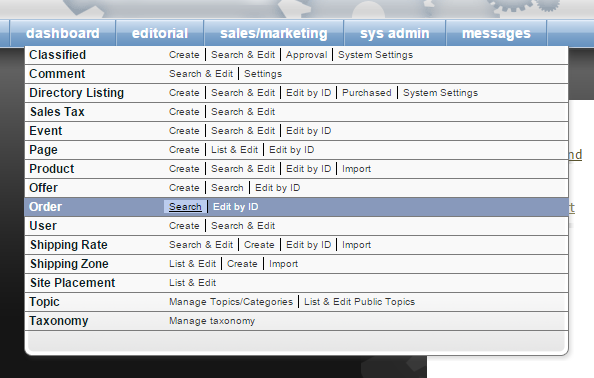 Under Sales/Marketing on your dashboard, click Search next to Order. If you know the specific order ID you'd like to view, click Edit by ID. 2. You may search for orders based on order ID, offer codes, product and user's email address. Zoom: You may search for orders based on order ID, offer codes, product and user's email address. For example, you may want to search for all orders using the offer code SAVE10. 3. Set how you'd like to view results by clicking on the dropdown menu. Zoom: Set how you'd like to view results by clicking on the dropdown menu. This sorts the results from A to Z by the last name of the person who placed the order. This sorts the results from Z to A by the last name of the person who placed the order. This sorts the orders from oldest to newest based on when they were placed. This sorts the orders from newest (most recent) to oldest based on when they were placed. Select Order Date Descending if you'd like to see the most recent orders placed on your website. 4. To limit the results to a date or time range, select a Begin and End of date range. Zoom: To limit the results to a date or time range, select a Begin and End of date range. Prev: How do I create a Classifieds or job listing? Next: How do I manage store orders?